UCLA researchers have developed a perovskite photodetector that could reduce manufacturing costs and improve the quality of medical and commercial light sensors. Now a research team led by Yang Yang, the Carol and Lawrence E. Tannas Jr. Professor of Engineering at the UCLA Henry Samueli School of Engineering and Applied Science, has developed a photodetector that uses thin coatings of perovskite — rather than silicon or other common materials. The perovskite coating is roughly 300 nanometers, about the width of a single bacterium, while the silicon layer in common photodetectors is 100 micrometers, or more than 330 times as thick. 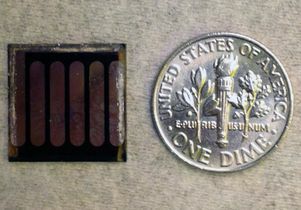 The photodetector is made using a process that essentially coats layers of the device in a liquid form of perovskite at roughly 300 degrees Fahrenheit. The process doesn’t require the energy-consuming high heat or powerful vacuum procedures used to develop today’s commercial photodetectors. “Our innovation is using the perovskite material on a photodetector, and then putting it in the proper structure so that the material can work most efficiently,” said Ziruo Hong, one of the authors of the paper and a research engineer in Yang Yang’s lab. In addition to Yang and Hong, other authors on the work include Letian Dou, who since working on the research has earned a Ph.D. in materials science; graduate student researchers Yang “Micheal” Yang and Wei-Hsuan Chang; post-doctoral researcher Jingbi You; and research engineer Gang Li.